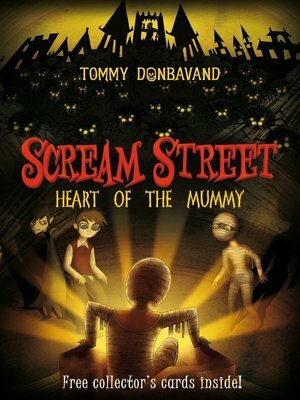 Scream Street has been shrouded in constant night for as long as the residents can remember, but when the streets become covered with millions of crawling spiders, suffocating everything in their path with their thick webbing, the residents realize they've had it easy up until now! Meanwhile Luke and his friends are searching for the third relic of the founding fathers, the heart of an ancient mummy, in their quest to return Luke's parents to the real world. Matters are further complicated when Cleo's mother turns up out of the blue, having been supposedly lost at sea and missing for many centuries. Luke becomes suspicious, wondering if there's more to Cleo's mummy than meets the eye – but can he persuade Cleo and her father to believe him before it's too late?